Do you work for an NGO in a challenged context? Do you want to advance your organization by improving your internal and managerial capacities or increase your effectiveness in fundraising and communication with external environments? Apply for the 5th Annual NGO Leadership Workshop and join us! The objective of the Workshop is to empower selected civil society representatives to strengthen their internal expertise, managerial and income generating capacities, abilities to engage with both general public and government stakeholders and assist in networking with international linkages. The Workshop is structured around presentations by distinguished experts and follow-up interactive small group discussions and Q&A sessions. • Pre-workshop welcome reception, May 27. Special guest welcome, Jakub Wygnański, President of Board at the Shipyard Foundation – Centre for Social Innovation and Research (Poland) and Member of the Education for Democracy Foundation’s Council. 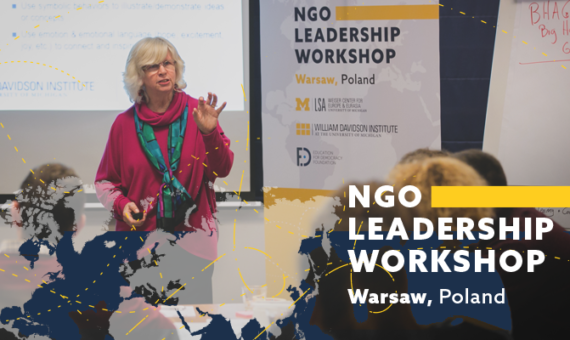 Essentials of NGO Management (Leadership, Change Management, Crisis Management) by Linda Gasser, Faculty Affiliate, William Davidson Institute & Lecturer, Cornell University. Planning and Sustainability of NGOs (Strategic Planning, Proposal Writing, Organisational & Financial Sustainability) by John Beauclerk, Faculty Affiliate, William Davidson Institute & Development practitioner with wide experience in NGO management, INTRAC. Fundraising (Individual Fundraising and Creation of a Case for Support) – trainer TBC. Marketing Strategy for NGOs by Peter Šebo, (Digital and Mobile Marketing, Marketing Strategy and Social Media) Faculty Affiliate, William Davidson Institute & Founder, CDO, and Digital Marketing Consultant, PS:Digital. The Workshop is open to 25 NGO leaders from Armenia, Azerbaijan, Belarus, Bosnia and Herzegovina, Georgia, Kazakhstan, Kosovo, Kyrgyzstan, Macedonia, Moldova, Russia, Serbia, Tajikistan, Ukraine and Uzbekistan. Priority will be given to persons holding managing positions at their organization. NGOs working in the following areas are preferred: human rights, minorities and marginalized groups, environment and natural resources, development of civil society. Participants will be selected through an open application process and will receive the training at no charge. The training itself is free of charge. Accommodation is provided by the organizer. Poland-based organizer, Education for Democracy Foundation (FED), will reimburse the travel costs of the selected participants to and from Warsaw, including visa cost and local travel, which are directly related to the NGO Leadership Workshop, according to the guidelines obtained after receiving confirmation of acceptance. FED will give approval for the proposed travel and will reimburse the costs. You will be required to keep all original receipts, tickets, and boarding passes for financial reimbursement. At least one dinner and four lunches and coffee breaks will be provided by the organizer. Breakfast is included for the participants staying at the hotel. Participants are expected to cover the costs of other meals during the week. The accommodation is arranged by the organizers in twin rooms at a hotel in Warsaw. Accommodation in single rooms can be arranged by the organizer as an exception and depending on the available funds. Upon completion of the program, participants will receive a certificate jointly issued by the Weiser Center for Europe and Eurasia at the University of Michigan (WCEE), the William Davidson Institute at the University of Michigan (WDI), and the Education for Democracy Foundation (FED). The deadline for applying is Monday, 18th February 2019, CEST 23:59. Application form should be sent to Tadeusz Rudzki at leadership.workshop@fed.org.pl with the subject ‘Application’. The applications will be evaluated and participants will be selected by the WCEE, WDI, and FED. All applicants will receive a response by 8th March. The working language of the Workshop is English. Therefore, advanced English language skills are required for successful completion of the Workshop. For more information about the Workshop, please contact Tadeusz Rudzki at leadership.workshop@fed.org.pl. The NGO Leadership Workshop brings together two organizations at the University of Michigan, both focused on strengthening democratic accountability – the Weiser Center for Europe and Eurasia (WCEE) and the William Davidson Institute at the University of Michigan (WDI) – as well as the local insight of the Poland-based NGO, Education for Democracy Foundation (FED), which works to support democratization and the development of civil society. The Workshop is funded by the WCEE.